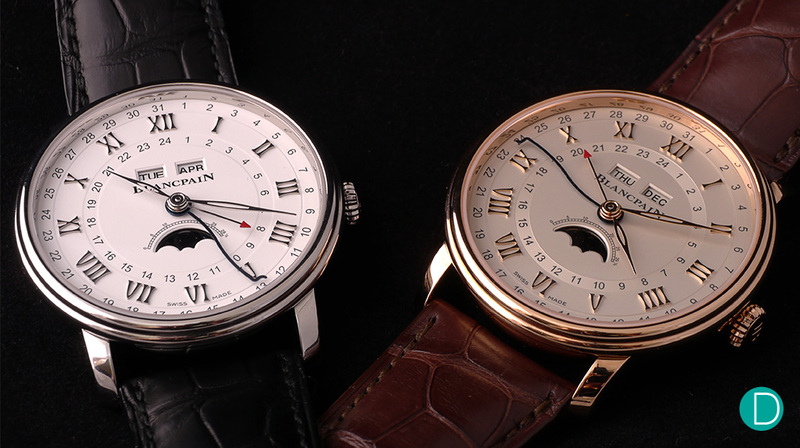 Blancpain’s complete calendar moonphase timepieces are some of the most iconic watches of the brand. 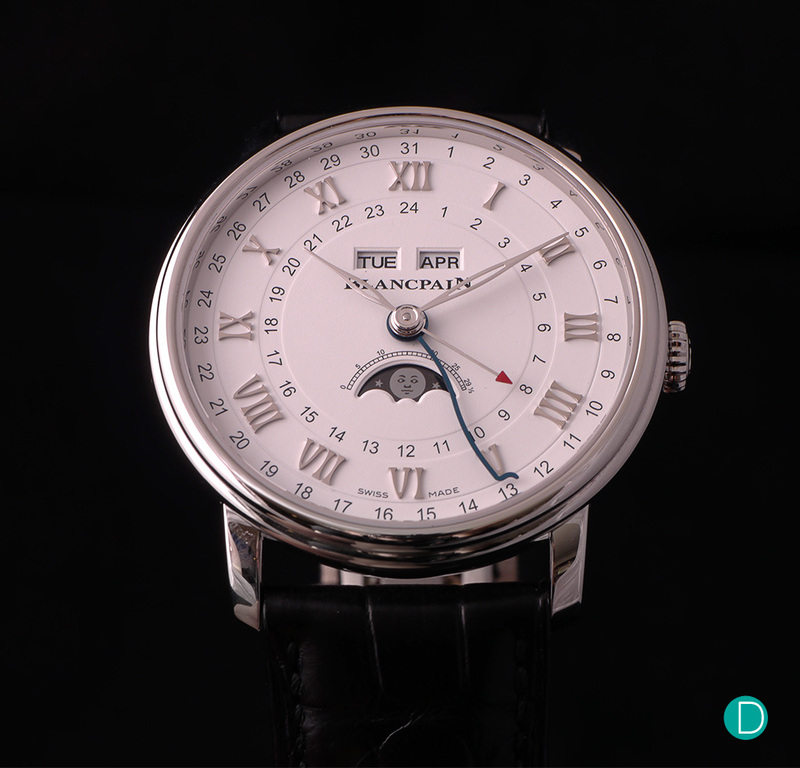 It is in essence a triple calendar with moonphase display. But in addition to the traditional layout, it also adds another complication, a 24 hour second time zone. 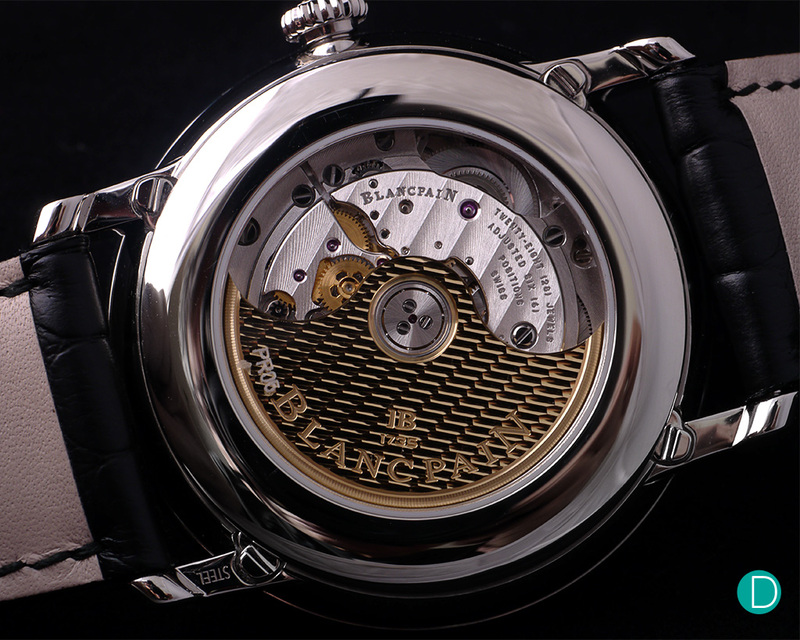 Here is the Blancpain Villeret Quantième Complet GMT. These features make the Blancpain an incredible option for a classic travel timepiece. 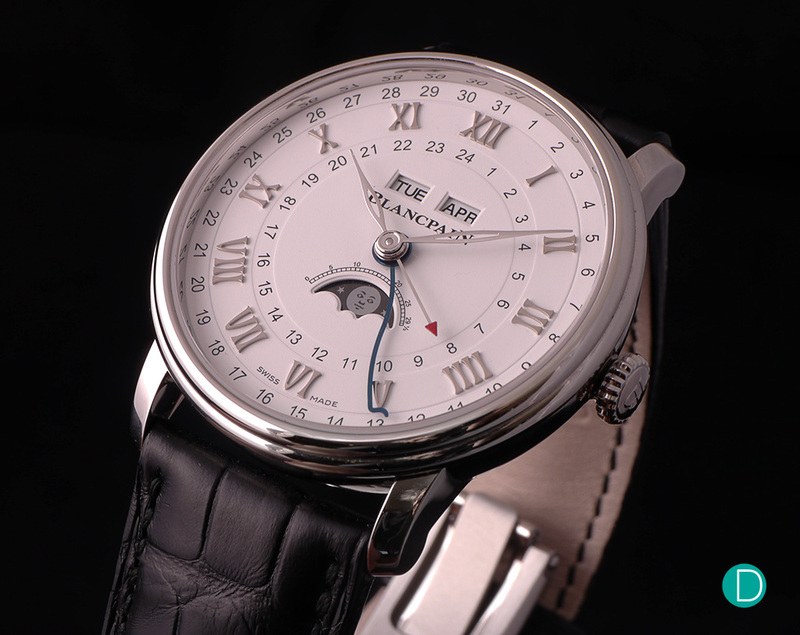 The Blancpain Quantième Complet GMT in stainless steel. The Blancpain complete calendar, or in French, the Quantième Complet GMT is available in stainless steel and 18 K red gold. The watch measures 40.00 mm diameter and 11.80 mm in thickness. It is fit with a sapphire caseback and is water resistant to 3 bar. 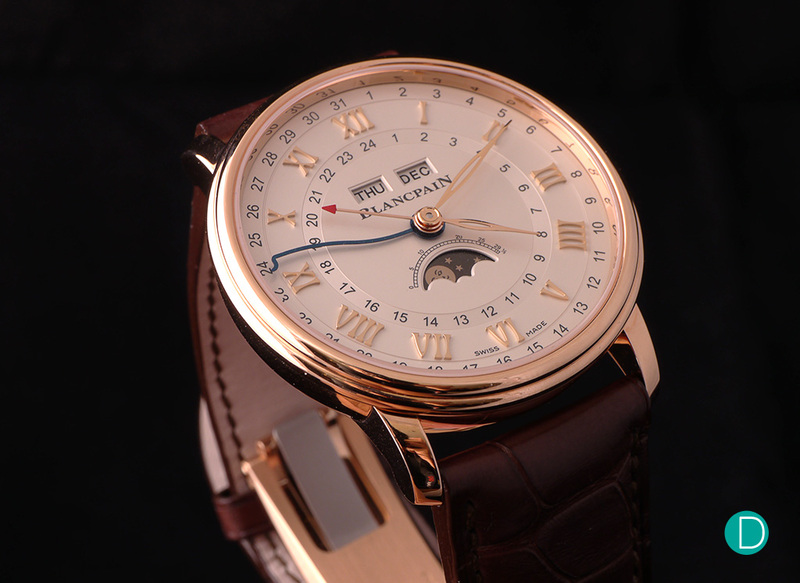 The Blancpain Villeret Quantième Complet GMT in 18 K red gold. The watch has a relatively slim profile and has a pleasant size. The case is rounded on the sides and back, and uses a step bezel to taper the height of the watch. 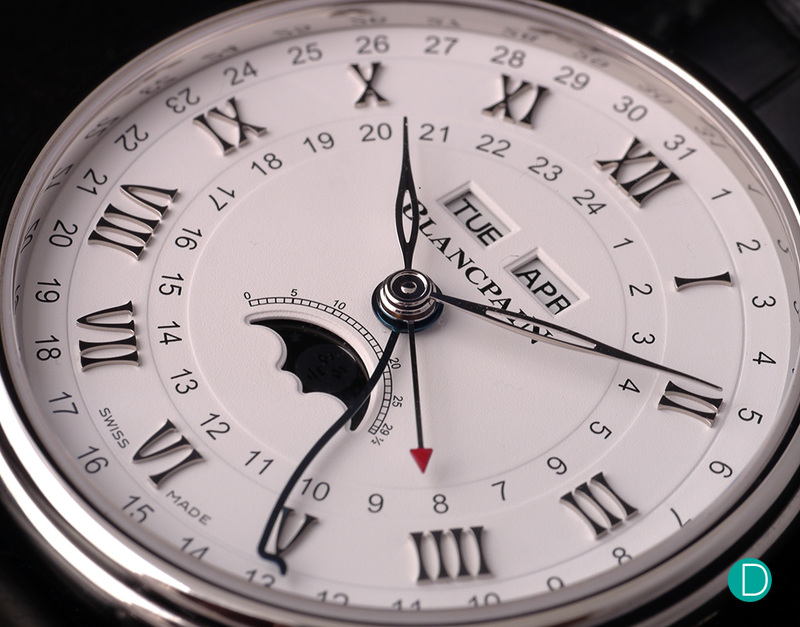 Sticking with the same Villeret case design, the Blancpain Complete Calendar is polished on all surfaces. The classic look is then made complete with a slim fluted edge crown. The red tipped hand points to home time on a 24 hour scale, and the serpentine hand indicates the date. 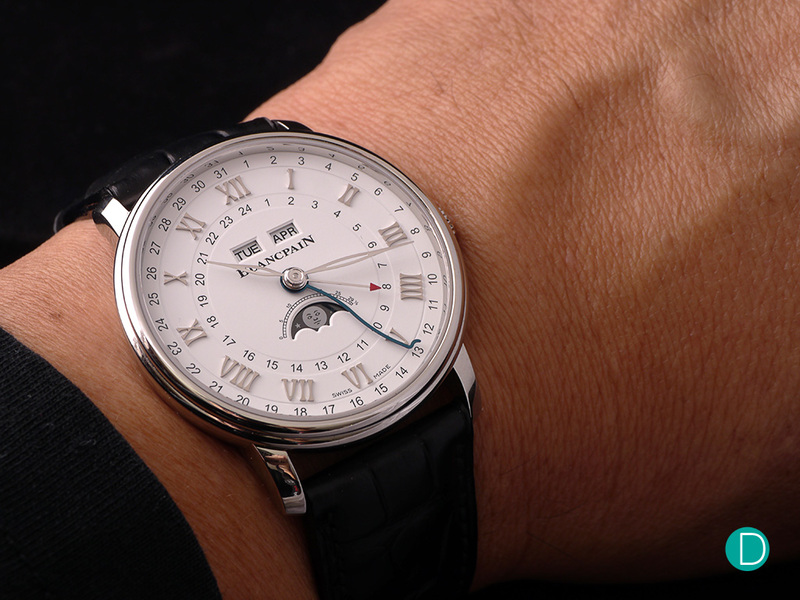 As with most calendar watches, the Blancpain displays the day of the week and month in windows. The date is displayed with the iconic serpentine date pointer. Not stopping there, Blancpain also adds a GMT function to the watch. The second timezone display is revealed using a 24 hour inner ring and a GMT hand. The watch features a full calendar and moonphase complication with GMT. 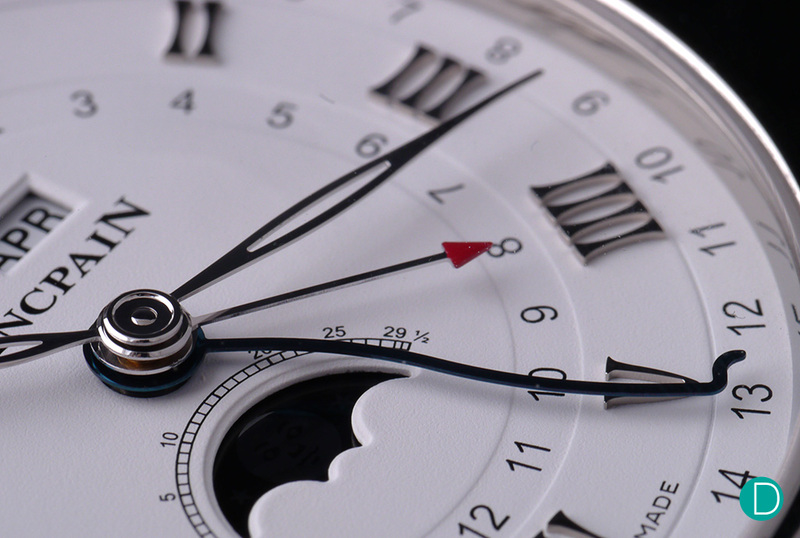 A quick set feature is also used for the main hours hand, through independent adjustments using the crown. Ensuring that the watch places itself as an ideal travel companion, the calendar indications are linked to the local time display shown on the principal hands. Home time is shown with a red tipped hand. The sapphire crystal caseback reveals the cal. 67A5 self-winding movement. The in-house movement cal. 67A5, is a movement based on the Frederic Piguet cal. 1151. The self-winding movement features a silicium balance spring and has a 72 hour power reserve. Other innovations used on this movement include quick adjust levers located at the underside of the lugs, that can be used to change the calendar and moon phase indications. This is in place of the regular push pin buttons found at the side of cases on other calendar timepieces. 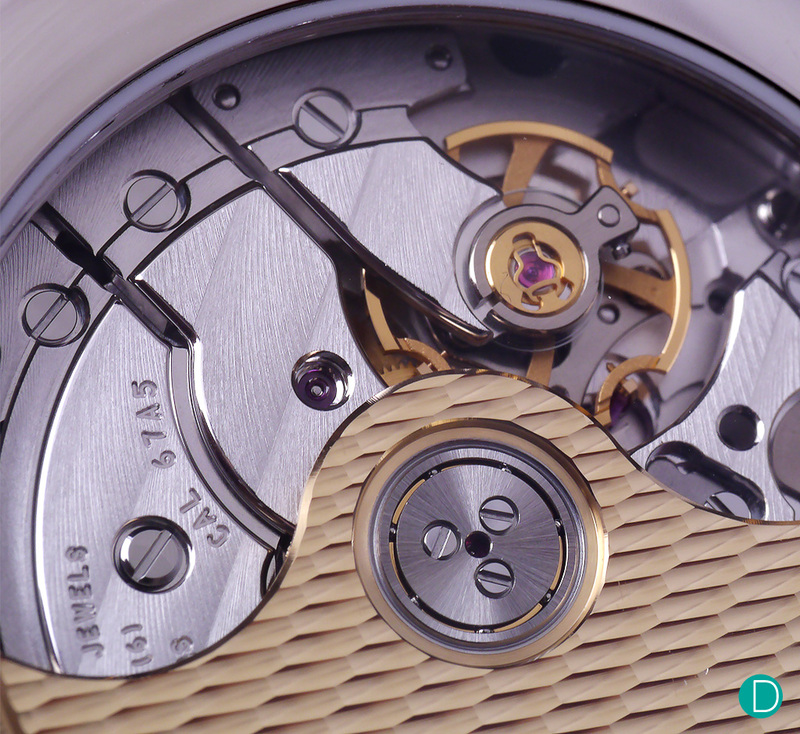 The movement is nicely finished, with Cotes-de-Geneve done by hand, chamfered edges and an engraved rotor. The new Blancpain Quantième Complet GMT, in red gold with an opaline dial and applied red gold Roman indexes; and in stainless steel with a white dial and white gold applied Roman indexes. The overall look and feel of the watch is classic, and rather pleasant. It is easy to maneuver and set the indications. The only qualm with it is really the clutter on the dial. 3 rows of indicators and 4 hands and another 3 window indicators suggest clutter. And with all the information going on in the dial, a lazy pair of eyes may find it too much of a chore to read the analog display after all. 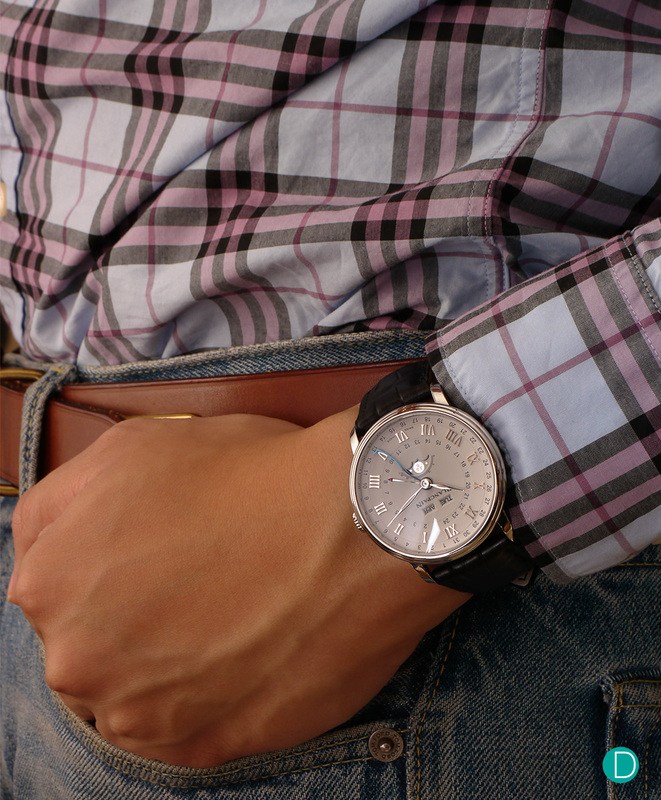 Sitting just above the cuff, the classic timepiece runs in style with tartan and denim. There are two versions of the new Quantième Complet GMT, in red gold with an opaline dial and applied red gold Roman indexes; and in stainless steel with a white dial and white gold applied Roman indexes. Both are fitted into 40 mm diameter cases with the traditional Villeret double stepped bezel. Alligator straps or metal bracelets are available for each.